Handmade pasta, artisanal breads, fresh-roasted coffee, just-picked produce and fragrant herbs share center stage at the upscale bistro, a prime attraction in the revitalized neighborhood known as Bluff View Art District. 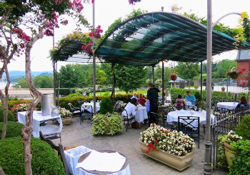 Located on Chattanooga’s 10-mile Riverwalk, within walking distance of the Hunter Museum of American Art and the Tennessee Aquarium, the 1 ½-block enclave is a popular stop for groups and other travelers. They come to see the lush herb and sculpture gardens, art gallery and bed-and-breakfast inn. There’s also culinary attractions, including an Italian trattoria, coffeehouse, chocolatier, pastry kitchen and bakery. Visitors can watch workers in action at most of them. The Back Inn Cafe, in a renovated Colonial revival mansion, is the neighborhood’s restaurant of choice for a fine dining experience that stars globally inspired cuisine and fresh seasonal ingredients. Guests enjoy panoramic river views from the outdoor terrace and two dining areas, the Upper Sunroom and the Lower Sunroom, each of which sits 30 comfortably. Dinner is the prime attraction, complete with candlelight, linen napkins and servers dressed in black. Lunch or other times are available by special arrangement. 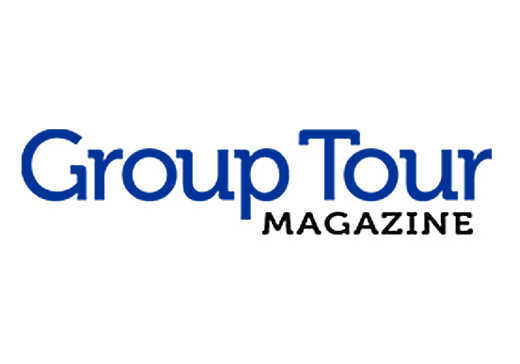 Groups larger than 30 may choose to book Renaissance Commons across from the Back Street Inn. 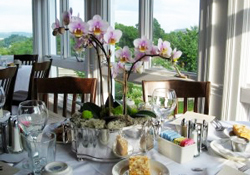 A popular special events venue with warm woods and stained glass windows, it offers plated meals for up to 80, buffet-style service, or a cocktails and hors d’oeuvres-style reception for 100. “We have an entire department geared just toward groups,” said Jordan Hayes, the district’s events coordinator, who works with trip coordinators from two weeks to one year in advance. 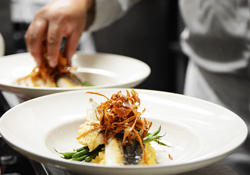 Typical three-course menus offer multiple choices of starters, entrees and desserts. Beyond a mixed greens or Caesar salad, popular starters include fried green tomatoes, braised pork belly, Charleston she-crab soup or a butternut squash salad. Back Inn Cafe also offers an extensive wine list, plus cocktails and beer, to complement meals. Motorcoaches generally drop off groups and return to the cafe at a designated time for pick-up, or collect group members at the turnaround at the nearby Hunter Museum of Art.